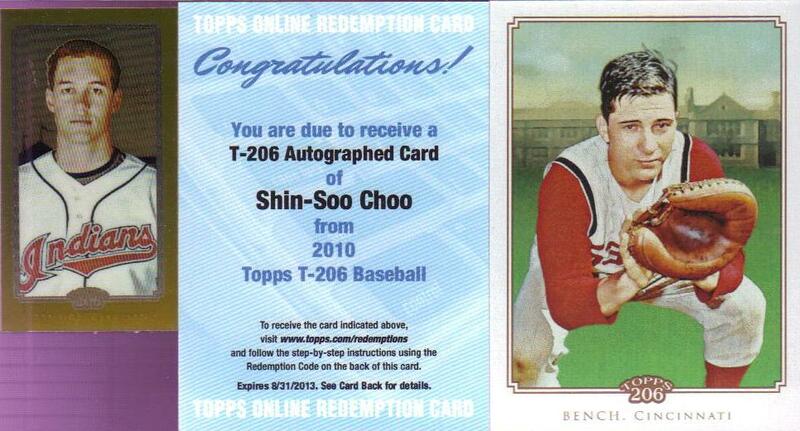 A mini gold shiny Sizemore (05/50), a Choo auto redemption! and a Johnny Bench. Sweet! I ended up with a handful of minis with various backs. In addition to regular issues, I also ended up with four gold cards and a slew of non-Tribers including Mr. Hunter who is from Pine Bluff, AR, which is down the road a piece or two from my house (about 100 miles). I actually ended up with a rather nice stack of cards, many of which will find themselves in my next giveaway. Oh yes, there will be an upcoming giveaway. Sadly, not as big as I used to do, but still a giveaway is a giveaway, right? Thanks goes out to the women of "A Cardboard Problem" for holding the break and sending me some GREAT Tribe cards! 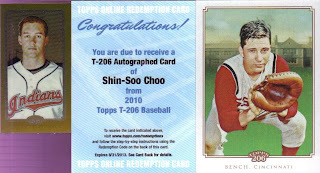 Oh, in case you don't follow me on Twitter of Facebook: I redeemed the Choo and delivery is expected "before 12/21/2010." Good to hear, I suppose.